​Marc is an award-winning popular historian and journalist. His narrative histories include 1941: Fighting the Shadow War: A Divided America in a World at War; The Millionaires' Unit: The Aristocratic Flyboys Who Fought the Great War and Invented American Air Power; and The Bonfire: The Siege and Burning of Atlanta. The Millionaires' Unit inspired the award-winning feature-length documentary of the same name. His articles have appeared in many publications, including Vanity Fair, Smithsonian, and Time. He is a frequent contributor to The Daily Beast on American military and political history and other subjects. He is presently working on a short biography of Admiral Hyman Rickover, father of the nuclear Navy (and so much more), and teaching a course at Quinnipiac University's School of Communications, spring semester 2019. Signed copies of Marc's books make great gifts. Marc has spoken to audiences of all types. If you are interested in getting a signed book or having him speak to your group, contact him to make arrangements. As spotlighted and excerpted in Vanity Fair, Marc's latest book, 1941: Fighting the Shadow War, is winning rave notices and international coverage. The book is now available from booksellers everywhere. "Book of the Month" and "MHM Recommends": "1941 is a good read...a different take on a familiar story. A very useful book for those with a serious interest in the period. Recommended." "...in his admirable work of popular narrative history... Roosevelt’s delicate balance between global strategy and domestic politics is superbly depicted by Wortman." "An engaging and well-researched look behind the scenes of an important historic era. Highly recommended." "A fascinating narrative of a domestic conflict presaging America’s plunge into global war." "A genuine page-turner. America’s declarations of war against Japan, Germany, and Italy may have been a geopolitical inevitability, but in Wortman’s hands the push and pull of the forces leading to that momentous point hum with the pulsating energy of a cliffhanger." "Like the rumble of thunder before a storm, Marc Wortman's 1941: Fighting the Shadow War creates a mesmerizing sense of ominous and terrifying foreboding. This is the fascinating story of the global war that most Americans know almost nothing about: the bitter and even deadly struggle pitting American against American as the United States confronted Hitler and Japan before our country's actual entrance into World War II. There were heroes and villains and, as Wortman depicts so richly up to Pearl Harbor, nobody knew who would win." 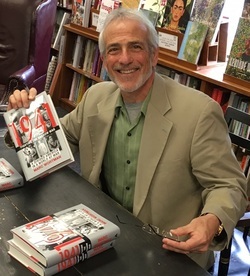 "Marc Wortman's 1941: Fighting the Shadow War tells the story of America's plunge into World War II in a way that is smart, suspenseful, and full of surprising historical twists. 1941 has the sweep and intimacy of an epic novel and the pace of a military thriller." "The story of Mr Roosevelt's Hidden War on Nazi Germany and support of the British effort in 1940-1941 has been told before, of course, but not I think with such verve and delightful panache as in Marc Wortman's new book. Its strength lies in his blend of characters high and low, from FDR and his highest confidantes to a normal family at Pearl Harbor to the U.S. journalists in Berlin as they saw war advancing across Europe and, then, towards America itself. It's a smart book, and a great read." For individual orders, support your local bookstores. Go to www.bookweb.org or www.indiebound.org to find bookstores in your area. Many local bookstores provide an option to buy from them online. You may also purchase his titles online at Amazon.com, Barnes & Noble.com, Books-a-Million.com/BAM, Hudson Booksellers.com and Powells.com. They had it all and risked all they had to fight and win a distant war in Europe. A story of innovation, sacrifice, heroism and leadership during the First World War. A city made by the Civil War and destroyed by its flames, Atlanta was full of paradoxes and secrets revealed in this tale of the greatest city siege in American history. An exploration of the contentious and portentous entry of America into World War II, as the nation battled the Axis long before Pearl Harbor while at home it debated its role in a world at war.